Happy Halloween. This is another recipe and frankly, everyone loves food so who cares if you make it after Halloween? My last strawberry recipe was really, REALLY popular :) So this is another variation on what you can do with strawberries. As strawberries are yummy! And chocolate is yummy! So it's a win, win situation when there's chocolate covered strawberries involved. Before we begin, this recipe is for the novice chef in everyone. If you can handle a microwave, you can cook these! Firstly, crumble up your white chocolate bar and place into a heatproof bowl. Then put the bowl into your microwave for around 2 minutes. Stop the microwave every 30 seconds to mix the chocolate up, using a spatula or wooden spoon. While you're waiting for the chocolate to melt (like the wicked witch) wash and dry your strawberries, using a sieve. Once the chocolate is ready move onto the next step. Now the best part, dunking the chocolate! Hold the stalk and dip it into the white chocolate. Make you coat one side of the chocolate. Carry this on for all of your strawberries, then let the chocolate set in the fridge. While you're waiting for the chocolate to set, melt the milk chocolate via the microwave. Let this cool before you fill a piping bag with this. Next, once the chocolate has set, coat the other half of the strawberry in white chocolate. Let this set again. 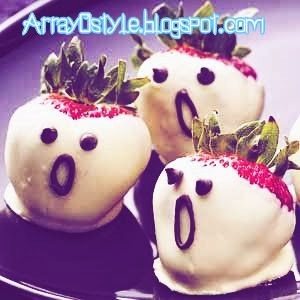 Lastly, use the piping bag to draw on two eyes and a mouth to the strawberry.